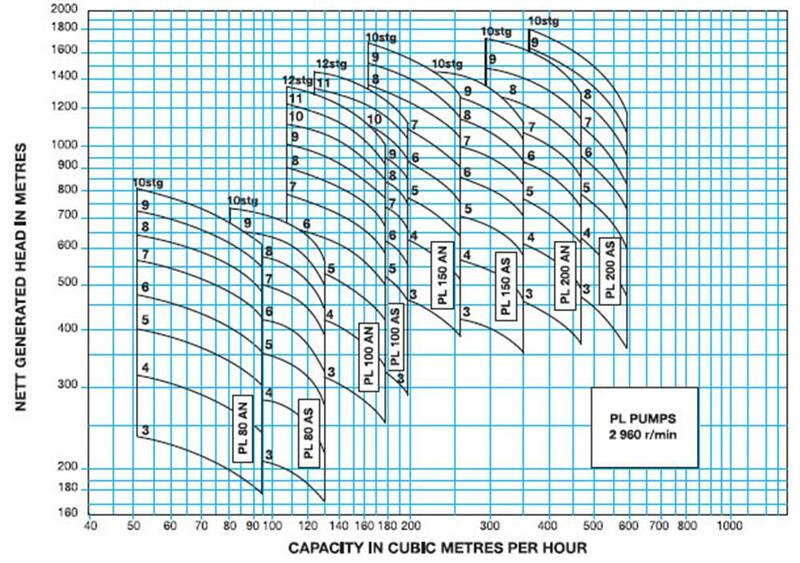 The PL/PJ range of multi-stage centrifugal pumps is designed for a wide range of high head duties at sustained highest efficiency. The range was developed against a background of many years of pratical experience and research; these pumps being particularly suitable for high lift mine drainage duties, main line water supply applications with formidable total heads to overcome, high pressure boiler feed pumps operating at elevated temperatures and for other general installations requiring substantial generated heads, allied to the well proven reliability and other special features of a heavy duty ring section design. 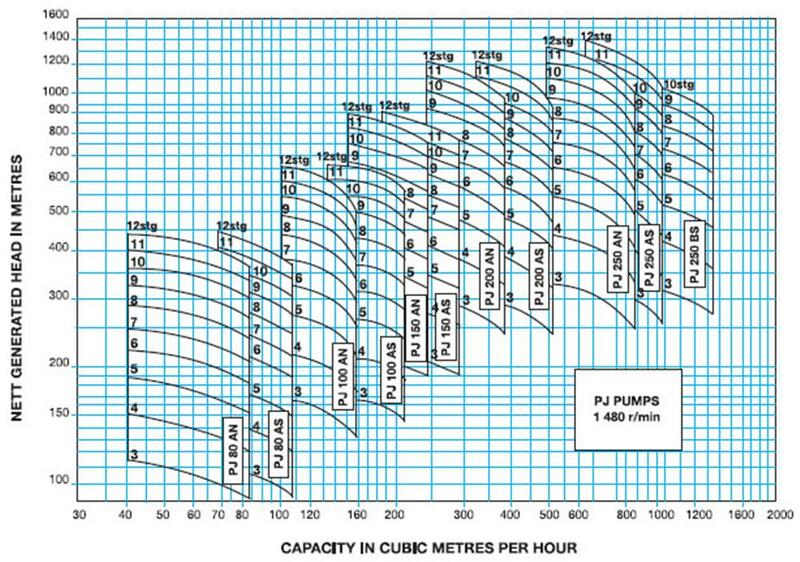 The selection charts below show the high generated heads achieved, with the stable characteristics offered by the PL/PJ range, at the standard direct coupled motor speeds of 1480r/min and 2960r/min obtained from a 50 Hz electrical supply. The pumps are also suitable for operation at other speeds, including those applying when direct coupled to 2 to 4 pole motors fed from a 60 Hz electrical supply. The design further allows for direct drive from power recovery water turbines of the Pelton wheel type, and for direct or indirect drive from virtually all other forms of prime mover. These pumps are of particular robust construction and embody the latest hydraulic design principles. The materials of construction are selected to ensure compatibility of rotating and stationary wearing parts combined with high corrosion and erosion resistance for prolonged life, sustained efficiency, reliability in service, and low maintenance cost. 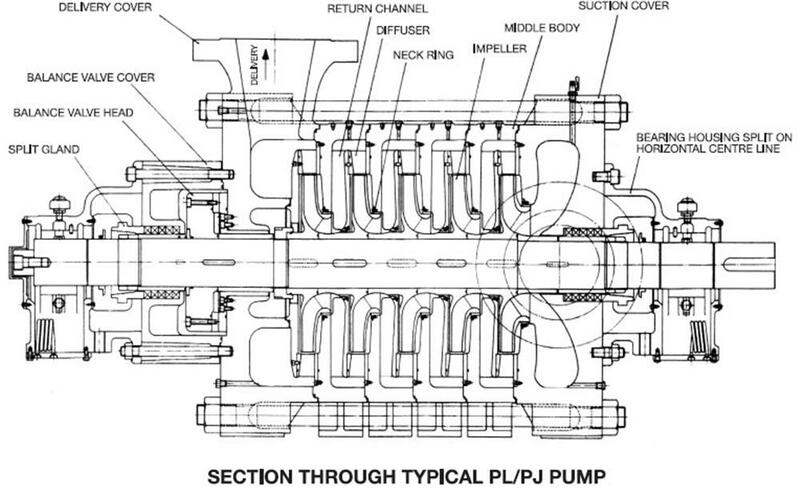 The second view of the typical PL/PJ pump shows the compact design of the unit. The pump is built up from a number of stages and the bodies are held together by the main body bolts tying together the suction and delivery end covers which incorporate the main branches. Each middle body is provided with feet so that the pump can be assembled in the horizontal position. This is advantageous especially underground where the space and working areas are limited. Horizontal assembly is further assisted by clamping bolts fitted between individual bodies to ensure the unit remain tight during the assembly work. The bearing brackets and bearing bushes are designed with a horizontal split along the centre line. This gives the advantage of being able to strip the bearing assembly without disturbing the alignment of the element, and without having to remove the pump, half coupling or the driving unit. The bearing brackets are supported at the top and bottom, thereby avoiding distortion of bearing bush / shaft alignment when the pump is under pressure. The balance valve cover is not disturbed when the F.E. bearing assembly is removed, thus avoiding the need to remove the gland packing and drain the complete pump. The body bolts are located in clearance holes drilled through the end covers and are fitted with nuts at each end. This avoids deterioration of threaded holes in the covers to receive the bolts. Bolts are spaced to avoid the pump branches and do not interfere with the water passageways. The balance valve assembly is designed to enable the wearing parts to be replaced at minor cost; therefore the stainless steel balance valve head will never have to be replaced, as it is provided with a seperate wear face. The balance valve seat and bush are two seperate items which can avoid the need to replace boths items at the same time. The impellars are retained on the shaft by an impellar lock-nut which is not disturbed during maintenance work on the balance valve assembly. This prevents interstage leakage along the shaft developing due to separation of impellar hubs during such balance valve maintenance. The pumps can also be offered with a wide range of alternative materials to suit special operating conditions and customer's preference. The running surfaces between the impellar necks and neck rings, impellar hubs and neck bushes, balance valve stalk and balance valve bush can be ceramic to reduce the wear and coated to reduce the wear and increase the life of these components. The maximum permissable total axial wear on the balance valve face / seat is 3 to 4 mm and the life of these components can be increased by stellite coating the running surfaces of the balance valve face and the balance valve seat. Upone request the conventional wear limit indicator can be replaced on the larger units by an electrically operated wear limit warning switch with provision for visual observation. For the more specialised applications, e.g. Boiler Feed Duties, features such as water cooled stuffing boxes can be incorporated in the design.